Naming One That's Wild: A Conservation Aid? “On a wild, remote island in Lake Superior, gray wolves have lived and thrived for almost 70 years. In the island’s forests—which make up the majority of Michigan’s Isle Royale National Park—a wolf population that grew to almost 50 individuals once contributed to a biodiverse, healthy ecosystem. In 2014, I had written those first two paragraphs in an article about Isle Royale’s wolves, and I asked if biologists should step in to save the population there by introducing more wolves to the island. At the time, the National Park Service had said in a statement that if the island’s population of wolves declined to all males or all females and if the moose population—already at 1,250 and climbing—grows to overbrowse island vegetation, bringing in more wolves would remain an option. Apparently, it wasn’t exercised, because I just learned today that there are only three wolves left on Isle Royale. It may sound far-fetched, but perhaps if Isle Royale’s nine remaining wolves had been given human names, their story might have ended a lot differently. 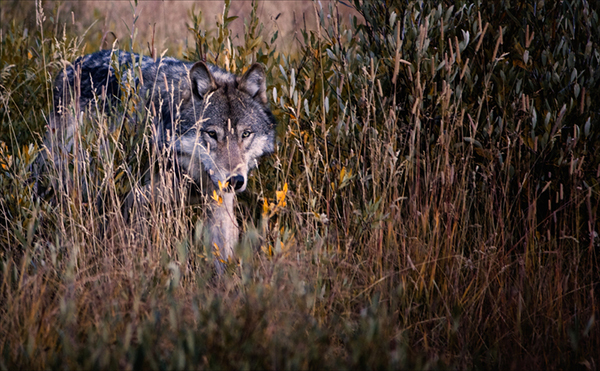 In Yellowstone National Park, researchers working with the wolf population purposely do not give names to the wolves. 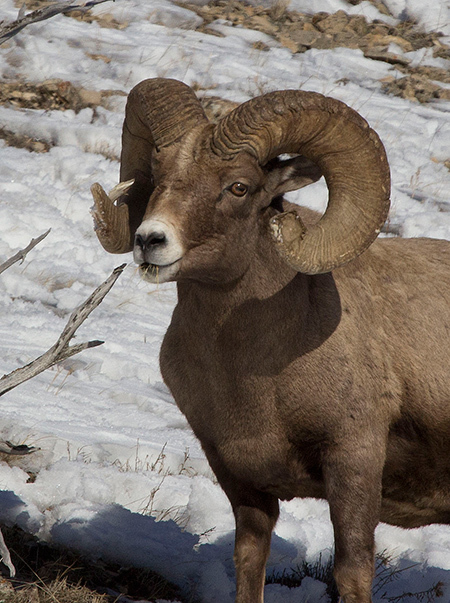 They are numbered to remind them—and us—that these animals are wild and not like our pets. Some scientists worry that giving human names to wild animals leads to anthropomorphizing and can carry associations for the researchers that could trigger bias. Other scientists argue, however, that wild animals and research animals that are named—and therefore seen as individuals—may be watched and tended more carefully, making them less stressed. They believe that’s better for the animals’ welfare as well as for scientific studies. They may have a point. Over the years, many reports have shown that it is not in our psychology as human beings to respond to the grand abstractions of catastrophe. Paul Slovic, a psychologist at the University of Oregon, calls it “psychic numbing.” Such concepts are too overwhelming; too distant from us. Our response is to tune out and turn away. However, what has been documented over and over again is that we do respond to the stories of single human beings (that’s why charity organizations focus on one hungry child to sponsor—not the millions that go hungry every day). This means that seeing and hearing singular stories becomes an open channel to communication, understanding and compassion. A couple of cases in point: I wonder if the tragic story of the demise of the passenger pigeon would move us as much without the tale of “Martha.” And more recently, would the dangers of feeding wild animals make as much of an impression on us without hearing about “Bam Bam the Ram”? National parks other than Isle Royale and Yellowstone have notable wolf stories. 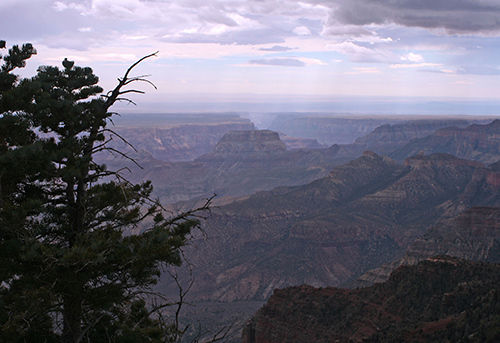 For 70 years, no wolf had been seen on the North Rim of the Grand Canyon. Then late last year, a beautiful, three-year-old female walked into the park. From a radio collar, it was determined that she had traveled from Wyoming to Arizona and then to Utah, a journey of at least 750 miles. On December 28, 2014, however, a local hunter, who allegedly mistook her for a coyote, shot her dead near Beaver, Utah. Are you more likely to remember her now? Do you think that simply giving a human name to a representative wild animal could move us to better conserve and care more for its species as a whole? The British BTO study of the Common Cuckoo has proved very popular in engaging the public in the study. Each of their birds are named and it allowed people to get involved by sponsoring a particular Cuckoo in order to fund the project. The oldest Cuckoo in the study is named after Chris Packham, and the TV show Springwatch, featuring the birds namesake has further popularized the study. I believe that names can lead to attachment and bias however I can see validity in the idea that it would increase vigilance! I believe there is merit to this idea, but also potential unintended consequences. In my view, anthropomorphizing can create illusional, if not delusional thinking among people. So for example, the animal rights movement, while serving many good deeds such as humane treatment of pets and lab animals, has created a lot of unnecessary hullabaloo concerning licensed and regulated harvesting of fish and game. Regulated harvests of animals like deer, elk, geese and so on very much help keep these populations in check to the extent that they do not overgraze and damage functional ecosystems. Hunting and fishing also introduces millions of people to nature and garners their support for conservation. And of course license fees, advocacy groups and associated purchases of equipment generate billions of dollars for conservation. So I am not convinced the naming of wild animals always generates best outcomes. Named bird pairs with web cams on them, like eagles or hawks are watched and loved by many people. Thus Brian is correct about the general public feeling compassion towards individual animals, especially those with names. I have a question about researchers and research. When humans are the research subject, does them having a name bias the research? What would be the difference with individuals of other species that are the subject of research having a name. I do believe naming an individual animal does instill a sense of compassion towards the individual and therefore towards the group. But we already typically feel compassion towards the species being studied, which means some of the bias is already present bit doesn’t necessarily make us less objective for collecting necessary data. Identifying the individual can also give members of the general public a better understanding of the needs of the individual as well as the group when reading results from a study. Giving the species a human name may help us develop a connection and eventually empathy for the outcome of the species. It certainly cant hurt. In my small world I am left to wonder why humans as a whole aren’t as concerned about the health of the planet and our connection to all species. What we have done to our world in so short a time is tragic. Considering the age of the Milky Way this destruction has happened in literally the blink of an eye. What happened to Echo was no accident. It was deliberate just like the crazy development (destruction) of our planet. Contentious I know – a sample needs a label but is giving an attribute a name in preference to a number reference any more subjective? After all we name phyla/genus/species instead of having an alphanumeric code! I think it has already been done with some particular rhinos and elephants Candice, and it did not work. I suppose any animal with a human name would not be in any position to waive that human name tag high above its head when faced with a hunter’s gun. Scientists appear to sometimes waste their time with ideas that will not work. We have been talking about giving personhood to wild animals for a long time now, but to no avail. That done, then killing an animal in the wild would amount to murder, and treated under existing laws as such. Thank you for raising this. It is is an important conservation topic – names are really important. Personally I cringe when I hear names like “Bam Bam the Ram” or “echo the wolf” BUT I agree wholeheartedly that it helps people see the animal as real and worthy of protection in a way a code or number can not achieve. From the other direction using codes or scientific names I believe sometimes creates unnecessary fear and concerns. We see this with toxins. Describe a poison for a operation that most people would support (for example protecting a critically endangered native animal from serious pest predation) as “the anticoagulant Brodifacoum” and watch the panic. Ironically many of the people concerned about the use of toxin Brodifacoum will happily go down to their hardware shop and buy “No rats or mice” poison baits for their homes despite it having exactly the same Brodifacoum poison ingredient. The difference is the name and what is acceptable and what isnt. Maybe we should just give them an alpha-numeric name like the car companies started doing because they were also having problems with names of cars and public biases. Just imagine a scene of “Q6s” on the Serengeti Plain or dolphins feasting on a school of M300s. Thanks Candice. Yes, giving human names to animals does increase the personal connection, and creates a sense of loss when that animal is lost or dies. I would always argue that intrinsic value is far more important. But really it comes down to employing whatever method is the most successful to achieve true conservation of species and habitats. From cars to hand tools, humans are known to name inanimate objects that serve a personal purpose. With a name, even if it is a humorous one, it gains value and we tend to take it more seriously. I understand science saying that it would interfere with studies but I think that if you make some sort of connection with the animal they might be better off. The pet industry is massive. We name our pets and will do anything for them because we care. If we can put that same effort into one animal in our home then we should be able to have that same passion for the ones outdoors. Jane Goodall named her subjects as standard practice, and she seemed rather good about keeping hands off of the individuals she was studying. In the wolf study did they figure out a reason for the population fall? Some think climate change played a part: beginning in the 1970s, ice bridges from Ontario formed about only once a decade (although there were ice bridges the past two winters). The gene pool steadily decreased, so a lot of the pups that were born were sickly (Isle Royale has the most extreme case of inbreeding ever documented in a wolf population). Thank you for your comment. —C.G.A. Would naming a creature mean automatically sacrificing our scientific consciousness if names cultivated a sense of compassion? We study organisms’ populations, physiologies, distributions, diseases, reproduction, nutrition, predator/prey ratios, and much more recently, behaviors. Do we scientists really stand to compromise our primarily lineal understanding of an animal should we choose to acknowledge it as an individual? The social behaviour of mammals is built on the differences between individuals, to study their social behaviour it is a necessary requirement to identify them individually. Whether you use names with human connotations, arbitrary word names, or number labels is a separate issue. The problem with a focus on individual animals as the target of conservation, is that it takes the focus away form the populations and habitats which is what really have to be conserved. It also shines the donating public’s spotlight onto individuals of charismatic species, or to cute babies rather than reproducing adults, and leads to howls of misguided anguish when natural processes are left to take their course.